Part of each sale through the iHeartDogs store is donated to Greater Good, which helps support various charities. Thanks to customers like you, happy endings, like the one below, are made possible. The Grapevine Animal Shelter reached out to Rescue Rebuild looking for help. Their old play yards were grass, which is hard to maintain and had parvo exposure, a deadly virus that can stay in the soil for years. This meant that they had no place to let their dogs outside! They were desperate to find a solution, and Rescue Rebuild was the right call to make. In April of 2016, Rescue Rebuild loaded up the trailer, gassed up the truck and drove over 1,500 miles to The Lone Star State. There they joined a team of over 200 associates from Mars Petcare to get the project done! With plans drawn and material purchased, it was time to get started. The first step was to install new turf in two of their outdoor play yards. This new turf will be easily cleanable and also won’t require any upkeep. And what newly turfed play yard would be complete without sun shades? These sun shades drape over the play yard providing shade and comfort to the dogs from that hot Texas sun. Now the dogs will be able to play outside longer letting their true personality shine, making them more adoptable! 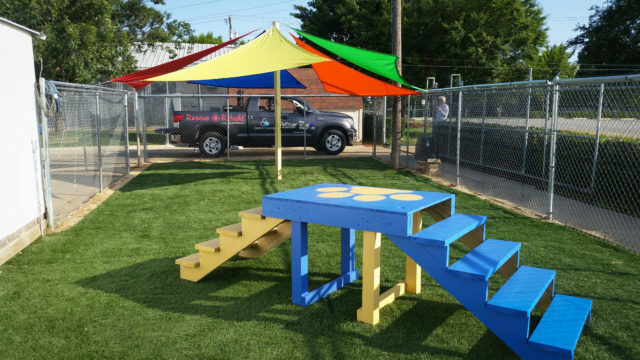 Because no play yard would be complete without new agility steps, the team constructed them, and new coyote rollers were installed making sure to keep the dogs inside the play yard. No matter the distance, weather or situation, nothing will keep Rescue Rebuild from helping shelters in need! With these new improvements, more dogs will be able to play outside longer and more comfortably in the shade. A dog that gets regular exercise will make for a happier, more relaxed dog which is more attractive to potential adopters. Hundreds of dogs have had a better life in the Grapevine Shelter while waiting for their forever homes thanks to your contributions to Rescue Rebuild! You can feel good about shopping from the iHeartDogs store knowing that your purchases – like the Rescue Rebuild 8 Bit Boys’ Premium Tee are making a difference! 20% of your purchase will help rebuild shelters! Rare White Serval In 360!